The lure of political chatter is one of social media's biggest productivity pitfalls. Here's how to silence the noise. The deluge of political rants, memes, and arguments in your Facebook feed is hardly ending—if anything, it’s getting louder. Whether you participate in these posts, just seeing them is proven to be wearing and stressful, and can ultimately be a drain on your productivity. You don’t necessarily have to swear off social media completely to get relief, nor do you have to start a campaign of “unfriending” folks with offending opinions. There are several free browser add-ons that will help you purge your feed of politics—or at least keep it out of sight long enough to get your work done. Here are a few of the best. You’ve likely dreamed of a solution that would remove only politics-related posts from your feed, while leaving the funny pet videos and other more enjoyable content. That’s exactly what this Chrome add-on boldly promises to do. Remove All Politics From Facebook scrubs your feed clean of post-election prattle. Like Remove All Politics From Facebook, Social Fixer also blocks political posts from your feed, but it gives you a little more latitude in how they’re filtered. Social Fixer adds a wrench icon to Facebook’s toolbar. To customize your feed, click it, select Social Fixer Options and scroll down to Filters. If you just want to impose a sweeping moratorium on all political posts, enable Election/Politics 2016 from the list of predefined filters. This will hide posts about anything related to the recent presidential election. 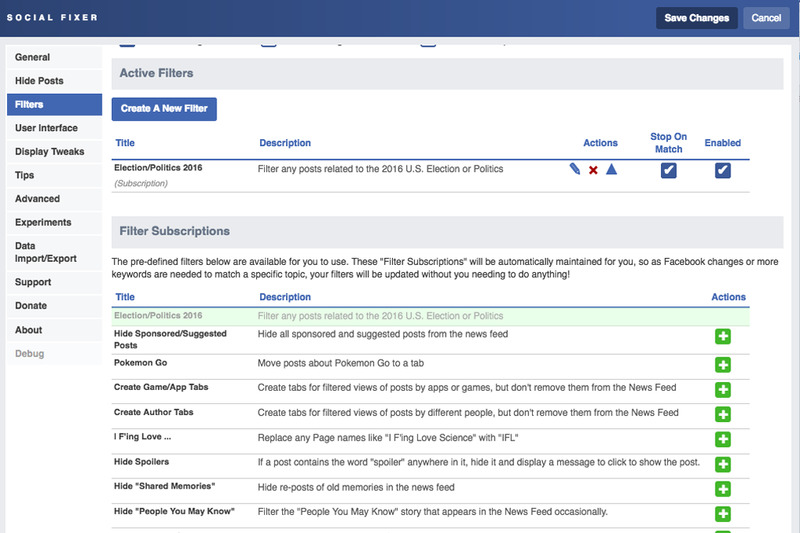 Social Fixer uses both predefined and custom filters to block political posts—and a whole lot else. If you only want to filter posts about a certain political party, issue, or person, click Create a New Filter. Here you can set your own conditions for what to hide using keywords. Filters will go a long way toward purging your feed of political articles and their ensuing flame wars. But they can’t block snarky memes, many posters’ preferred way of voicing their opinions. To truly ensure you aren’t distracted by political posts in your feed is to block it altogether. News Feed Eradicator for Facebook blocks access to your feed and live ticker only, while still letting you get to individual profiles. If all else fails, there’s always, if you’ll pardon the expression, the nuclear option: blocking your access to Facebook completely. Add Facebook and other politically charged sites to Leech Block and designate times to restrict access. 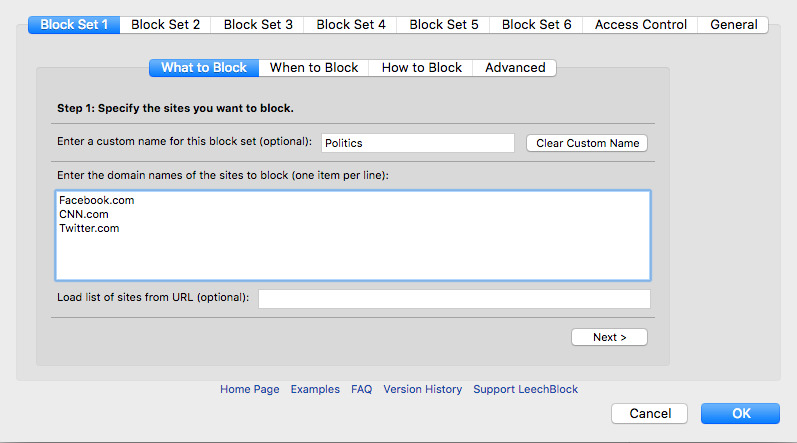 LeechBlock bars the door to any site you tell it to. You can add up to six domains—so feel free to toss Twitter, major news sites, and any other political forum into the mix as well—and block them for specific time periods you define—during work hours, for example. By keeping a lid on your feed only when you need to get things done, you’ll reduce your exposure to potentially productivity-sucking posts when it matters most. This article originally posted January 9, 2017, and was updated February 20, 2017.